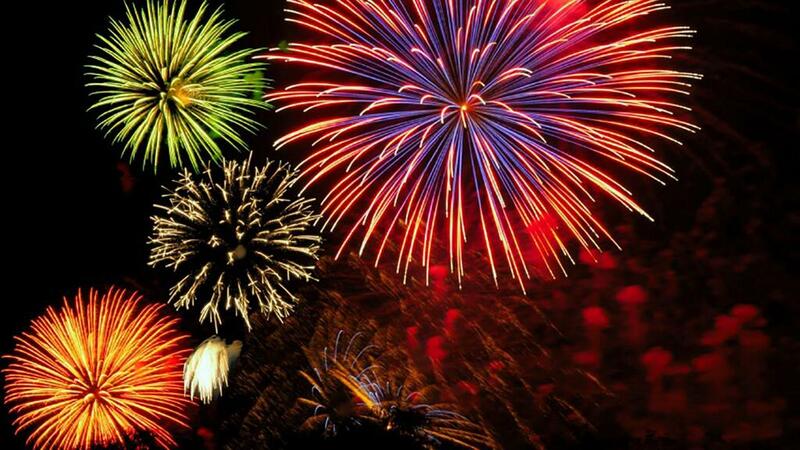 As a child I used to love going down to Santa Monica Pier to watch the fireworks on the 4th of July. As the adult owner of three dogs—not so much. I have to say that this has been by far the worst 4th of July I have ever experienced. 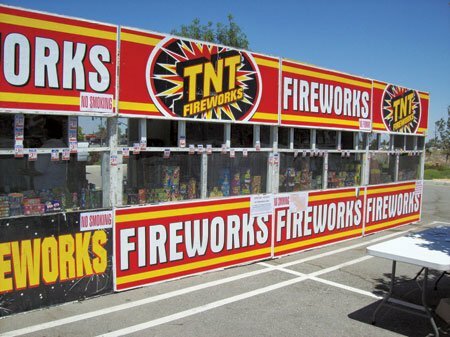 For starters it seems that fireworks are quite legal in Palmdale. Yes, I have seen the stands all over town for the past two weeks. And yes the occasional firecracker has been going off for the past two weeks–not fun, so not fun. Marley already has PTSD—this is so not the holiday for her. 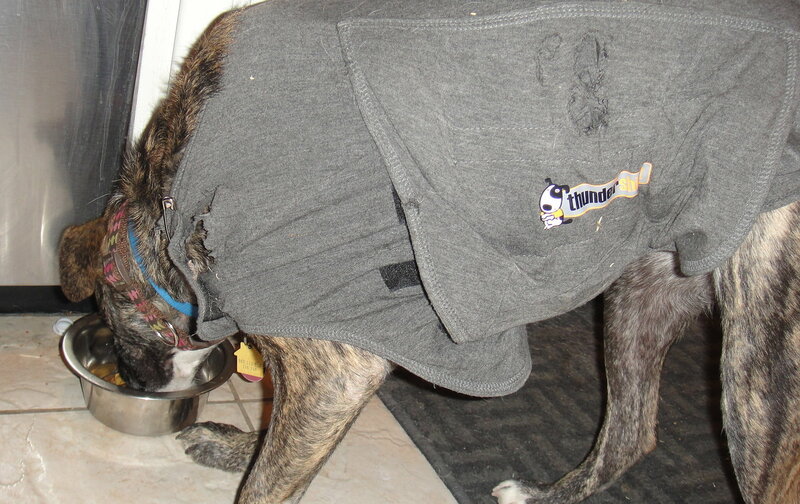 I decided to buy her one of those thunder shirts, that are supposed to calm dogs–like giving them a continual hug. I measured Marley to make sure I got the right size as these shirts cost $40.00. I bought the correct size based on her measurements and the shirt was still a tad large. If you scroll down you will see a picture of Marley in the shirt and the condition currently of the shirt as Marley has been trying to chew it off. 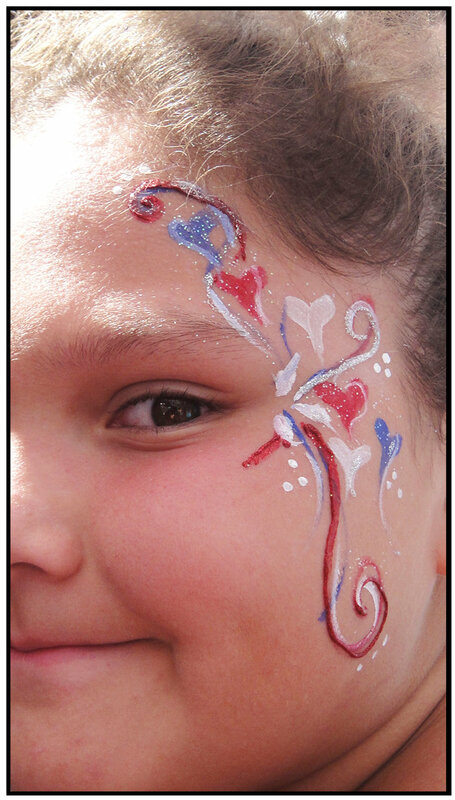 I had a face painting job today at the Calabasas Swim & Tennis Club. 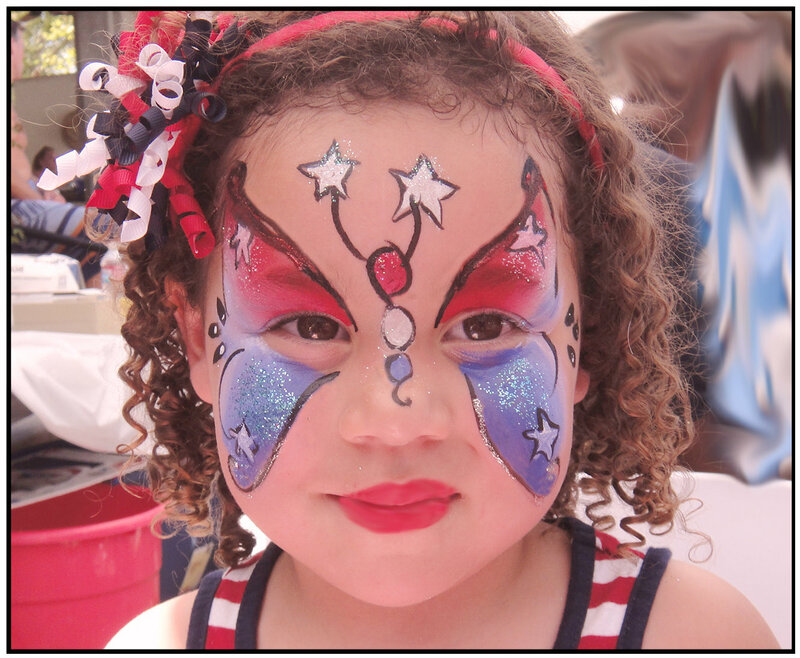 Good thing the job started at 3:00 pm because I got to bed at 5:00 am after spending a few hours putting together my face paints and looking for 4th of July designs on the internet. 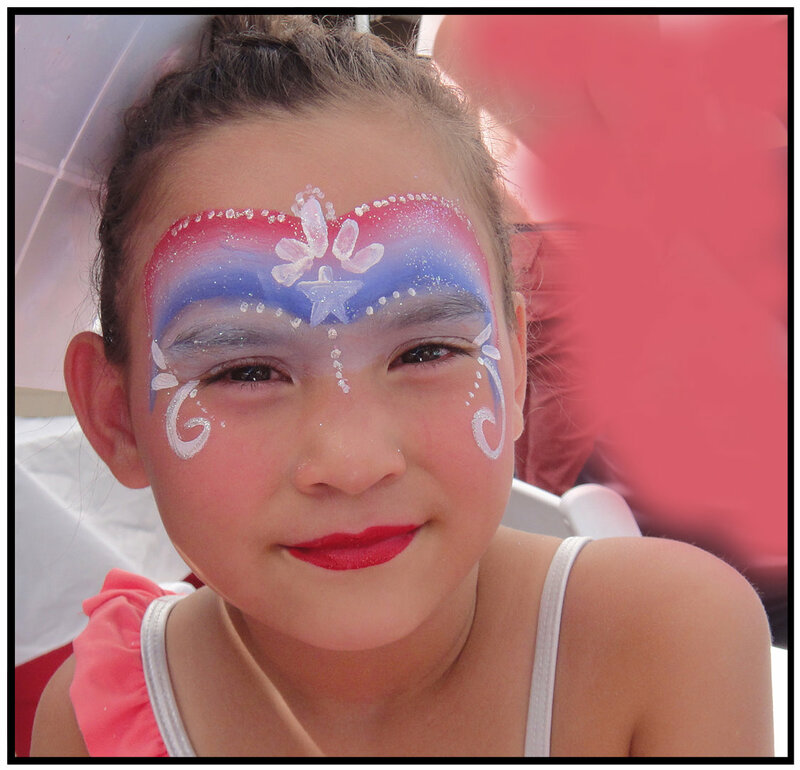 What was interesting was that I found some of the same pictures that a colleague had emailed out to all the party people as her face paint designs.–Hmnn–mental note for next year find cute designs on the web and claim them as my own. I barely sit down to face paint when some mother starts complaining that her child should be first. Really? Because it seems to me that another mother had come up to me while I was setting up and asked me where the line was and I told her, just wait over there. So the mother who thought her child should be first per me was actually the fourth child to get in line. I’m thinking I haven’t even painted a face yet and no one has been there more than five minutes and the adults are already arguing over who should be first. Yes there are shy children in the world who don’t know how to wait in line and just let other children in front of them. That does happen. Here’s the thing when I am hired to face paint I do just that face paint. I look up and monitor the line as best as I can but t is not my job to teach your child to be more assertive. I did have two kids in line arguing over who was next. And how do I solve that one? Simple I tell them if they don’t stop arguing in my line neither one of them is going to get painted. That usually gets the kids behaving better—but excuse me where are the parents and why aren’t they parenting? Oh it’s a country club they are having drinks by the pool. Here are three of the designs I did today. Now knowing that my residential area was going to be shooting off fireworks all over the place my plan was to get down with work at 5:00 pm race home let the doggies out before it all started. No such luck. I got a call while on the job that a performers relative had passed away and they were catching the next plane back to the east coast. My thoughts on the matter are better left unsaid. However I shall say that I was not able to go to my own grandfathers funeral because I had work commitments. So that being said I had to stop at my mom’s and prepare another performers costume to cover those jobs. My plans to be home before dark just flew out the window. But I did try. As I pulled off the freeway exit I could already see the fireworks going off at 8:30 pm. It wasn’t even totally dark yet. In retrospect I should have quietly walked into the house and pretended I wasn’t home because just my arrival got all the girls going. Of course I had left them in three separate areas away from each other—-lest they were to get to riled up and a fight break out while I was not home. I quickly realized that they still needed to be kept separated as the two pups were going nuts with noise. Marley got put in the bathroom–quite den like and I thought safe as she could not destroy anything in the bathroom or hurt anyone else. Missy and Maddy–who seem to get along lately were put into my bedroom. All the plans to clean and organize went out the window. In all the surrounding neighborhoods fireworks were being set off. Go to the back yard and I see fireworks. Go to the front yard and I see fireworks. Three houses down the neighbors apparently had a huge arsenal of fireworks such that at 11 pm they were still shooting them off. I have such a headache–it really sounds like a war zone around here. Even the cat started freaking out it was so loud. I can’t imagine how people who actually live in a war zone do it—wow. I know it’s not really a war zone just fireworks—but the air is smokey and smells horrible as well. And the way the wind was blowing those damn things were literally going off on my rooftop. I was afraid the house might catch fire–quite scary actually. 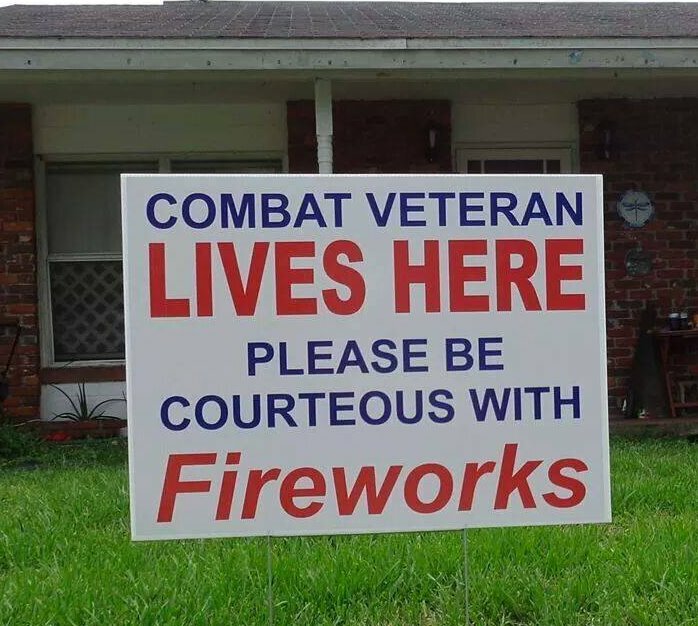 I had seen this meme on face book earlier today letting people know vets live in the home be c careful with fireworks. I didn’t really understand how fireworks could really trigger PTSD until tonight. It really felt like a war zone so I could only imagine our vets who had served were going through. I did some research and many of them avoid fireworks. There is that moment of panic as I think how am I going to unlock the door from the outside. After the panic fades I think –the French doors. There is a set of French doors from the bedroom that goes to the back yard. If those doors are unlocked I can let them out that way. The French doors were locked but for the first time since I moved in I see that there is an outside lock with a keyhole. I try the front door key and viola– I get the dogs out. With the noises fading down it’s quiet enough to finally feed everyone. In my naiveté I leave Marley and Maddy along in kitchen so I can write the blog…….and then it happens Marley picks a fight with Maddy over some veggie nuggets. Here we go yet again. I grab Marley by her hind legs so I can pick her up. I have learned not to put my hands near her mouth when she gets like this. Both of the girls are fine–no blood was drawn. And that is how my 4th of July ended. I have to deal with this regularly. On the other side of the trees in my garden is the old Domecq house which is now the San Roque club. They have parties with fireworks nearly once a month- and two of our dogs are incredibly sensitive. The Brittany Spaniel rescue is afraid of any loud noises; which is probably the reason he was dumped on the streets (as being afraid of noises doesn’t make for an ideal hunting dog). I get treats ready so I can give them out the second we hear the first bang. That hasn’t fixed their anxiety, but it does distract them and they’ll eventually hopefully associate the noise with something positive. I’ll have to try the treats next time. I can’t imagine going through this once a month. Once a year is bad enough. In Long Beach it was just an occasional firecracker going off–but I kid you not it really felt like a war. And I could hear all the other dogs in the neighborhood howling as well. Next year I think I am going to ask the vet for sedatives. I have tried the natural stuff but it doesn’t do much. I think everyone is finally sleeping quietly. Thank you, I have been face painting since I was 19 years old. What a July 4th you had, but you came through it and survived everything. So proud of you. What an explosive experience! We usually put on white noise or crank up the tunes a little louder (tv too) to drown out the noise outside on events like this and New Year’s when people go crazy with their noisemakers and firecrackers. From the decade of travelings, I learned that the best offense is a good tactical defense … make your noise to drown out the others is how this wacky lady creates a protective shield! Hope next year is a better experience for your queendom! I will be better prepared next year. I figured it would be bad when I saw all the displays selling fireworks–but I did not think that they would literally be going off right above my roof. It sounded like an invasion. And I got a headache because I had t.v. on loud to drown out sounds but it didn’t really help much. Oh well live and learn. Thank you Terry, feeling a bit hung over from all the stress though. People have been letting off fireworks around my house nightly all week. My oldest dog has, more than once, stepped outside only to hear a boom and turn around. The younger one is a bit more tough skinned, but I feel for Izzy. We’ve decided we probably won’t be doing anymore fireworks at our house on the 4th until we have no pets. It’s just not nice to do to them. I thinks it’s better to go to a park or a beach where the city is doing it away from homes and dogs. I have had dogs for 20 years but I have never lived in a place where it was legal and the neighbors were doing it. And guess what, there is leftover shrapnal all over the street–do you think they are even going to clean it up? I am temped to pick it all up and then after dark dump it back on their lawn so they can clean up their own mess.